Connor arrived in Wonderland on October 22nd, 2018. He had just come from a good ending where Markus and the others have won their freedom through peaceful protests and demonstrations and Connor has become a Deviant. He has not died at all during the course of the game, but if you would like to see how he'll be portrayed (my playthrough), feel free to check out his application. Connor arrived to Wonderland right before an AU event. He met a few people, so he's had most of the answers he could get. He's still not certain about what to expect here, but all he can do is adjust the best he can. His first event didn't go over so well for him. He became Machine Connor during it, after taking out Markus and North and doing what CyberLife designed him for. Now that the event is done, he's starting to realize just how bad things could have gotten if he hadn't realized what was going on. Now he's dealing with a lot of questions and even trying to understand what it means to have emotions and free will. He's even decided to adopt a dog. After a while of thinking, he decided to name him Jericho to keep the people of Jericho in his memories after everything that's happened. There was a few events, but the main one that really affected him was around Christmas time. There was suddenly a huge influx of people and the White Queen couldn't seem to handle the load of people. As a result, he managed to find a few people from his world. His first encounter was with an RK800 model (60) who has just a machine and it just reminded him of his time during the AU event. It was not a pleasant conversation between the two. Luckily right after that, he found Kara, Markus, North, Kamski, and even Hank. He had learned that Hank came from another world before this and had the ability to speak to & understand dogs. It was a pleasant surprise to see Sumo as well. Just like some of the people from his world, he managed to find Monika again and in her own body. It was good to see her again and she seemed excited to be able to actually be able to play in the snow. She also took advantage of the holiday to sneak Connor under a mistletoe. It was the first time he'd ever felt so panicked and uncertain of how to feel after having his first kiss. Overall, he had a decent time, but time passed and soon enough, everyone disappeared. He felt pretty sad to see Hank and Sumo go, but knowing that Kara was still around was comforting to him; even if they weren't on the best terms. Right after the Forth Wall, the White Queen decided to through a New Years Ball to try to make up for what happened with the event, so he attended out of curiosity and even learned to dance a little. There was another AU event where people had one regret they'd done changed, but Connor wasn't affected by it. Right after the event though, he happened to come across Hank once again, but this time he didn't remember Wonderland. Now that Hank has come back -- and less likely to disappear due to an event -- he's glad to have his partner back and has been trying to ease him into Wonderland's setting. Since then, nothing too noteworthy has happened. There was a possibility to start up some sort of organization to help protect people in dangerous situations; Most likely during events when they get chaotic. He showed interest in helping, but nothing is set in stone yet. Things are getting better between Kara and him as time goes on. They were finally able to talk to each other and have a pump-to-pump conversation about their circumstances while she was teaching him how to cook. Things aren't nearly as bad, but they're slowly taking baby steps to understand each other. At least she's not trying to run away from him anymore. A few people have come back from canon updates after chalk started to come to life; All thanks to Alice's magic chalk. The time has passed, but the chalk still remains in his room in a basket if he needs to use them for whatever reason. With Louis and Clementine coming back after updates themselves, he's had a good talk with both of them, trying to be there for them as much as he can. It's also helped to talk to Clementine about regrets they both have and bonding in the process. Just listing my choices that I took for this playthrough, but things might change in a future date. Connor arrived in Wonderland. He was able to gather the information he needed, and now he just needs to settle in. He also made a few friends and even met someone stuck in the Network. He has a good start so far. Connor's first Event changed him in to Machine Connor, making him believe that he had done as CyberLife -- and Amanda -- had designed him for. He'd taken out both Markus and North and completed his mission, only to realize that he was going to be deactivated in the end. He "arrived" back in Wonderland, thinking he'd never been there before. Connor is sharing his feelings about the event with Louis. It seems neither of them had a good time and their counter parts have brought about some questioning thoughts and some scars. He's faced with realizing just what could have happened to him, had he never come to terms that he was a Deviant for longer than he wanted admit. Connor has a lot to think about his life. Realizing how bad things could have happened, he's second guessing a lot of things. Otherwise, he decided to adopt a dog. There's also an apology in order. Satoru was asking about some of the worst events people have gone through, although this was only the first of many for Connor. Maggie is trying to put together a dog park and looking for people to help her out. Since Connor just adopted his doh, he's interested in trying to help out however he can. Alice announces possible options for the next event coming up with some very cute ideas. Connor is more curious about her and how she can tell when they're coming, though. With Christmas coming up, Juliet put up a post about doing a pre-Christmas get together. Connor didn't attend, but they spoke about Christmas and he introduced himself. There was a sudden burst of people arriving (yay forth walls!) and though Connor didn't really speak to many people (to keep from burning out on too many threads at once), he came across a lot more people from back home than he'd expected to ever see here. He first found another RK800 model that came from a timeline where he'd remained a machine. It was a weird sight for him see be seeing double, but more than that, the conversation was extremely trying. Being faced with who he used to be and what he could have become troubled him, because it made him think about when he'd stayed a machine during his first event and what took place. In the end, the conversation didn't go well. Right after encountering the other RK800 model, he managed to find the AX400 that he'd been chasing for attacking her owner and taking his child with her. They had a very tense conversation due to the nature of what happened, but being a deviant now made him more sympathetic and sorry for how he acted before. Though the encounter was tense, it was also strangely comforting in some ways. And a little while later after his encounter with Kara, he ran into Markus. He was finally glad to see someone who might not hate him (maybe...?) He didn't speak long with him since he seemed to have found North. Connor saw North around, but didn't speak with her (mun-cest reasons/handwaved). After a while, he was so glad to be able to see Hank again. Other than explaining the basics to him, there were able to catch up a little bit and he introduced Hank to Jericho. There have been a lot of things on Connor's mind that he hadn't shared in depth with others. Considering he was speaking to Hank, he told him about the AU event and knowing that Hank would have done something terrible had he gone down that route. They shared a moment and comforted each other. He also informed Hank about the other RK800 model and learned that Hank had come from another world like this before coming here, not directly from Detroit like the others. He even had the ability to speak to/understand dogs, as well as summon Sumo. He also found Kamski idling around, interested in strange things as he often is. He asked if he had any role in programming androids with the ability to go deviant intentionally, but as expected, he didn't get a straight answer and let it go. After meeting a lot of people he knew from back home, he managed to find Monika again and in her own body for a change. It was great to be able to talk to her and see her again. She was excited to play in the snow, but used the holidays as an opportunity to sneak him under a mistletoe, stealing a kiss from him. That left him flustered and confused about how to react, but he pushed that aside to let her have her fun with the snow. With everyone disappearing again, he felt a little sad that Hank and some of the others had gone back home, but he assumed it was Wonderland off to it's shenanigans again when everyone suddenly came in. He was pleasantly surprised -- Albeit tense -- when he heard from Kara. He offered to help her if she had any questions or needed anything, but she doesn't trust him; which is understandable. After some reflecting and frustrating back and forth here and there, it left things very tense between them (as expected). Even if she doesn't particularly like him, he does find some comfort in knowing he's not the only one here from Detroit anymore. The White Queen decided to throw a New Years Ball to make up for what happened to the event. Connor attended more due to curiosity than anything else. At the beginning of the night, he was approached by R. They just had some idle chatting about there being a lot to take in and just doing some small talk. Louis tried to get Connor to do the robot, but he said for a later time. Instead they just recapped what happened during the event and hung out for a while. A little while after that conversation, he spoke to him about cantaloupes being evil. He'd seen Kara around all night trying to dodge him, but he didn't bother to approach her about it. If she wanted to talk to him, she would. She did seem pretty silly trying to dodge him though. Finally around Midnight, she approached him and spoke to him. They actually had a civil conversation about not being sure about how to dress and some of their habits due to their programming, which is a relief from their tense conversations thus far. After speaking with Kara, he noticed Kokichi shoving confetti into a pillow case for some reason. He came across Juliet again when she asked him to dance. He's not really sure if he would like to dance, but he's hesitantly willing to give it a try. Hank has returned to Wonderland with no memories of being here before or even the other world he was from before. Either way, Connor is happy to see him again and is helping him adjust to Wonderland. Wirt was talking about how time in Wonderland was wacky and wondered if the White Queen was keeping track of time now. He also brought up that his birthday was in a week, causing Connor to ask more about what it was like to celebrate them. Stan is trying to sell "real golden coins" to people that happen to have a tracker in them. Connor questioned why would they need to get them from him if they could technically get them from the closets or a vendor if they really wanted them. Naoki was asking people to face your fears, but Connor can only assume what to do. From the little experience he has, he assumes you have to push yourself out of your comfort zone in order to do what you need to do. Chloe brought up that there was once an organization to help protect those who have been killed in the past and others as well. With the leader gone now, she suggested starting it up again. Wendy brought up the idea to have some sort of message wall for those who have left Wonderland. No new activity for February. Only older threads due to real life complications. Connor was curious about learning how to cook and decided to call upon mombot to help with that As a result, the two of them learned more about each other in unintended ways. Hank and Kokichi stumbled in on their cooking session as well. When R came back from a canon review, he came in rough shape. Connor helped untie him and tried to figure out what happened. With chalk coming to life, there's been a bunch of chalk doodles running around and Connor is curious. Meanwhile, he decided to try to draw Sumo. ♚ VISUAL: Connor will more than likely appear as he normally does. The only difference is that as he spends his time in Wonderland, he'll probably dress more like a human (now that there's no need for him to wear his uniform); As good as it looks on him, he'll more than likely retire it unless there's a reason to wear it. While he'll be wearing more casual clothing, he'll probably continue to dress sharp. He may -- at some point -- take out his LED, but that's undecided for now. ♚ DEMEANOUR: Detroit: Become Human is a massive game that heavily depends on how the player chooses to play. There are many outcomes to your choices, but this is especially true for Connor. With Connor, it's up to the player if Connor becomes a Deviant or stays a machine. That's why I think it would be better to just consult his application for how I plan to portray him as in entranceway. ♚ AURAL: There's nothing better than Fuckingpassword. ♚ SPOILERS? : Other than the many different ways to play Detroit: Become Human, the obvious is that Connor will be coming from an ending where he has not died in the game at all and he became a Deviant. Although I would like to say is that I have only played through this game once and I'm currently on my second playthrough to fill out my Flowcharts to as close to completion as possible. I plan on playing through all of the paths as much as I can, but as of right now, I don't know much about Nines or what happens when Connor dies every time he's able to do so. That's why I'd like it if others can keep from spoiling that for me, as I'd like to be the one who experiences it for myself. In regards to other people wanting to avoid being spoiled, let me know and I'll keep whatever spoilers I can to myself. ♚ FOURTHWALLING: Forthwalling is a little complicated. Normally I'd like to say no to this, but considering he is from one of the many endings, I might not be against it? The best course of action would to be to just contact me ahead of time and ask. I'm leaning towards no since there's so much yet that I need to figure out yet, but we'll see. ♚ PHYSICAL AFFECTION: I have no problems with physical affection. I can't guarantee that Connor will know how to respond though. He'll probably be really confused, but definitely not against it. It will all just depend on the CR that he has with the other character involved. ♚ PHYSICAL VIOLENCE: I'm more than okay with fighting, since I suspect that he'll have to do it at some point. I'd just need a reason for why, but that's always possible during RP plotting and what have you. I don't really have any limits when it comes down to injuring besides prior plotting and asking about it first. As long as Connor doesn't die (unless it's been plotted out), I'm okay with it. At this point, I'm not exactly sure how getting Thirium will be possible here, so hopefully nothing that will severely injure him if there's no way to fix him up. ♚ RELATIONSHIPS: You're free to try it, but more than likely, Connor won't be interested in something like that. Maybe over time when he figures out his emotions and maybe forms a connection with someone, he might. Right now, he's very new to really feeling emotions. He's still getting used to the idea that he has free will and a range of emotions that he can actually feel as to just emulating them. As for in cast ships, I'm not exactly against them, but I don't particularly ship him with anyone at the moment. The most common ship with Connor is with Hank for obvious reasons, but honestly I don't know how to feel about their relationship. I have nothing against the ship and I'm borderline HankCon, but unless a Hank comes along and wants something like that, I'm not too concerned otherwise. As for the others in the cast, I suppose it all depends on mun stances as well as CR that happens in the game. TLDR; I'm open to the idea of shipping him, but I don't really have any plans to do so right away. It may take a while for him to even understand what that really feels like. If something happens with the right CR over time or there's RP shenanigans that contribute, than I'm happy to go along with it, but otherwise I'm on the fence about it. ♚ FIRST THING: Ask a thing that you’re wondering if people will be okay with. Give any details they might need or tell them what information you need from them. ♚ SECOND THING: Ask another thing that you’re wondering if people will be okay with. ♚ THIRD THING: Ask another thing that you’re wondering if people will be okay with. Timeline: A good end where Connor hasn't died and became a Deviant. Character History: Detroit: Become Human is heavily influenced by the player's choices -- and Connor has a huge part in how the story goes -- so there are many different ways for Connor to develop as a character. Because of that, I'll be writing this application the way that I played the game myself rather than what it could have been played like to keep it simple. 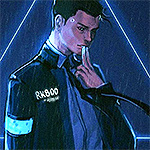 Connor is a RK800 prototype android of CyberLife. It's noted that he's one of the more advanced prototypes ever created by Elijah Kamski himself in order to aid the Detroit City Police Department with their investigations. His primary function is to hunt down androids who become Deviant.